For a number of years, Heights Farm Pet Foods have been at the forefront of the market place supplying hypoallergenic dog food to a rapidly growing customer base. To date, with an increasing number of dogs suffering from allergies, our wheat and gluten free range containing all the nutrients towards their wellbeing has been providing excellent health results. The flavours offered ensures there is plenty of choice available for discerning palates, but whilst enjoying our food did you know that your dog can also receive the added benefit of “extra joint care” ingredients? We believe it is important to take care of your family pet from puppy stage. Therefore, we have a variety of hypoallergenic food available which is not only wheat and gluten free, but also contains ingredients to support the development of joints and muscles, and will continue to provide extra protection against joint and associated pain throughout life. Our special “Extra Joint Care” ingredients include Glucosamine and clinically proven Green Lipped Mussel. Other natural ingredients such as Rosemary, Seaweed, Milk Thistle, Peas, Nettle and Beetroot complete this best-selling range. Daily feeding from the “Extra Joint Care” range of foods, for example; Salmon and Potato, Chicken and Rice, and Lamb and Rice, will provide the extra care beneficial to your dog. Please ensure when selecting your purchase, it states it is from the “extra joint care” range. We are committed to supplying you with food which is proven to be safe and effective for your dog to enjoy a healthy lifestyle, and we will continue to offer a first class service, direct to your door. Should you have any questions on any of our hypoallergenic dog food we would be happy to hear from you. 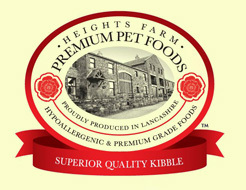 A family run business situated on the hilly outskirts of Bolton, Lancashire, Heights Farm Premium Pet Foods is an exciting, newly established company offering some of the highest quality pet foods available in the market place today, with a considerable cost saving over leading brands. We offer a very friendly, personal 7 day service with free local delivery, and operate a low cost national next day service for the rest of the UK. © 2019 Heights Farm Premium Pet Foods.